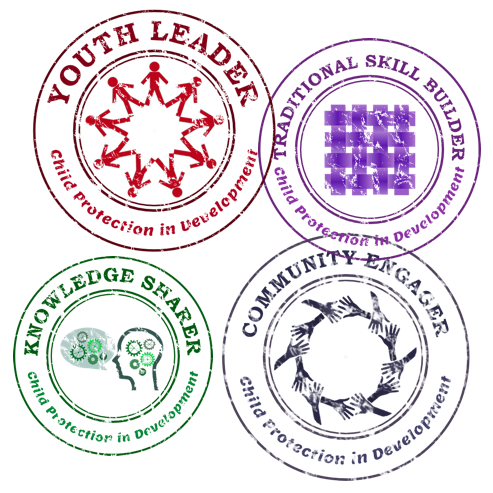 Stamps are markers of achievement for specific competencies earned through YouLEAD, CPID and community-based learning environments. Skill Recognition Stamps are typically offered in collaboration with partner organizations and communities. Stamps are placed on a participant’s profile, shared through social networking sites and can be displayed on a participant’s electronic resumé or CV to demonstrate core competencies to employers and academic institutions. Participants demonstrate community engagement and participation. This can mean volunteering time at community events or with community members who need support, actively sitting on community committees or councils, recruiting other volunteers on initiatives etc. Participants demonstrate traditional skills as taught by community knowledge keepers and trainers. This can range from traditional skills such as hunting, drum making, beading, rites of passage, traditional story telling, language use etc. to traditional community engagement activities such as helping at feasts and ceremonies or learning oral histories from Elders. Participants demonstrate their ability to share knowledge, learning and traditional practices with other youth and community members, using a variety of creative toold. this includes presentations, social media, creative arts and expression, film/video etc. Participants demonstrate ability to understand, articulate and support the rights of children, youth and Aboriginal peoples and their access to justice, and participate in activities to stand up for these rights. Participants demonstrate use of participatory action research tools, are able to gather and understand information and present these findings to key decision makers. This could include helping writing proposals, managing teams and budgets etc. Particiapants demontrate job readiness as well as their ability to put their knowledge and skills into action in a work type setting.